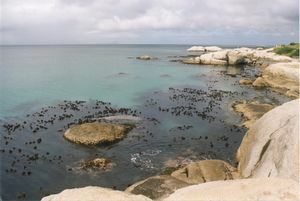 The dive site Penguin Point or Boulders is a shoreline rocky reef in the Seaforth area of Simon's Town on the False Bay coast of the Cape Peninsula, near Cape Town in the Western Cape province of South Africa. This is a shallow dive site with easy access and good facilities. 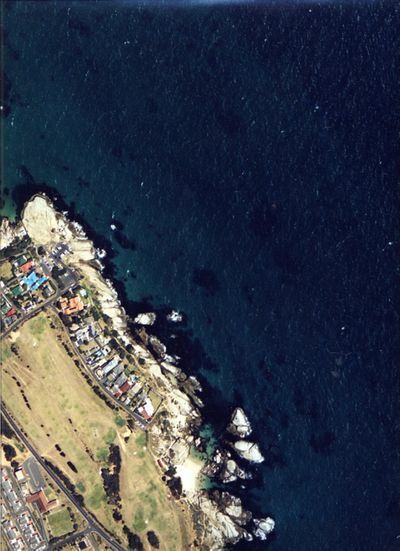 This is the point where Simon's Bay meets the south coast of the Cape Peninsula, and the coastline makes a distinct turn, becoming more exposed to the swell and winds from the southeast. The gully at Penguin Point. This is also an access route for the penguins. 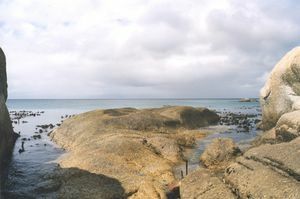 The beach at Seaforth in Simon's Town has been known as "Boulders Beach" for generations, due to the large granite boulders, both at the end of the beach, and scattered along the shore and shallow waters. The alternative name "Penguin Point" refers to the sanctuary and resident colony of Jackass penguins. Quite shallow, generally less than 8m. Flat gently shelving sand bottom with occasional low rock outcrops. There is a line of high reef quite close inshore, and large shoreline boulders and gullies. Geology: Granite of the late Pre-Cambrian Peninsula pluton, surrounded by white sand. The site is exposed to south easterly winds and waves, and sheltered from south westerly swells. The site is usually considered a winter dive, but there are also occasional opportunities at other times of the year. Tarred and demarcated parking area at the bottom of Bellevue road, usually with attendants. Security is good when parking attendants are on duty. There is a restaurant at the parking area, and clean toilets in good condition at the ticket office. Usually a shore entry dive. There is good paved parking at the bottom of Bellevue road, sometimes full on a good day. 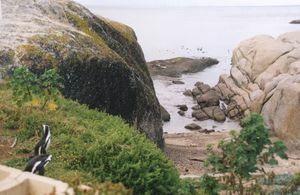 Entry at the beach to the north of the parking area, from beach or the low rock at north westof the beach, or from the deep and fairly steep gully to the west of the parking area, between two large granite outcrops. The beach is controlled by SAN Parks Board and there is an entry fee. The gully is to the left of the flat rock at the extreme right of the photo. Entry is from the flat rock. Inshore diving is along the rocks to the right of the photo and the reefs shown here. The flat rock at the mouth of the gully. Entry is from the far side of this rock into fairly deep water. Exit is to the left or right of the flat rock. Both of these places can get quite rough in an onshore wind. In an emergency exit round to the right at Boulders Beach, or at Windmill Beach to the left. Be careful of some rusty steel bars (foreground left of centre) and pipes. The rock outcrops are thickly covered by crinoids, grey sea cucumbers and sea squirts. White feathery sea pens in the sand retract when disturbed. Kelp forest over the reef. You may be exceptionally lucky and see penguins under water. They are common in this area but very shy in the water. Be the first to post an underwater penguin photo from Penguin Point to this website. No special routes recommended. The area to the east and south of the gully is interesting. No special skills required. Suitable for novice divers and snorkellers. This page was last edited on 26 November 2010, at 13:44.